The mineralminers.com® Virtual Gallery - Collector Quality At Miners' Prices!TM Try our Natural Color Kunzite Lapidary Rough Satisfaction Guarantee - compare our prices and our superior quality. This genuine kunzite crystal is 1.3" long x 0.8" x 0.5"
This lightly included kunzite crystal is transparent with light pink natural color. Kunzite Dimensions: 3.75" long x 2.3" x 1.8"
This natural kunzite specimen is a translucent kunzite crystal section with some areas showing pale pink natural color. Kunzite Dimensions: 4.9" long x 3.5" x 1.8"
This natural kunzite specimen weighs 1.75 pounds! It is a translucent kunzite crystal section with areas showing pale pink natural color. Kunzite Dimensions: 5.2" long x 4.2" x 2.5"
This natural kunzite specimen weighs 2.25 pounds! It is a translucent to semi-transparent kunzite crystal section with some areas showing pale pink natural color. This natural color kunzite is 1.3" long x 0.6" x 0.5"
This kunzite specimen is a kunzite crystal section with very pale yellow (almost colorless) natural color. It is transparent. This genuine kunzite crystal is 2" long x 0.8" x 0.5"
This two inch long kunzite crystal is transparent with light pink natural color. This natural color kunzite crystal is 1.8" long x 0.8" x 0.8"
This genuine kunzite crystal has pale lavender-pink natural color. It is semi-transparent to transparent. This genuine kunzite crystal measures 1.4" x 1.3" x 0.4"
This natural kunzite crystal specimen has light lavender-pink natural color. It is a transparent kunzite crystal with a relatively thin flat shape and natural terminations. This natural color kunzite crystal is 1.9" long x 1.1" x 0.7"
This genuine kunzite crystal is transparent with pale lavender natural color. This genuine kunzite crystal is 3.1" long x 0.75" x 0.3"
This 3.1 inch long kunzite crystal is transparent with a relatively thin flat shape and very pale lavender-pink natural color. This natural color kunzite crystal is 3.75" long x 1" x 0.3"
This genuine kunzite crystal has a thin flat shape. It is semi-transparent to transparent with pale pink natural color. this natural color kunzite crystal is 2.6" long x 0.9" x 0.4"
This genuine kunzite crystal is unheated and untreated with pale pink natural color. It is semi-transparent to transparent. This genuine kunzite crystal measures 1.6" x 1.3" x 0.8"
This natural kunzite crystal specimen is unheated and untreated with light lavender-pink natural color. It is a transparent kunzite crystal with natural terminations. This natural color kunzite crystal is 2.3" long x 1.3" x 0.4"
This natural kunzite crystal section has a thin flat shape with natural lavender color. Kunzite Crystal Dimensions: 3.4" long x 0.9" x 0.6"
This 3.4 inch long natural kunzite crystal is unheated and untreated with natural pale lavender-pink color. It is mostly transparent with natural terminations. This natural color kunzite crystal is 2.8" long x 0.9" x 0.5"
This genuine kunzite crystal has light to medium pink natural color. It is semi-transparent to transparent. 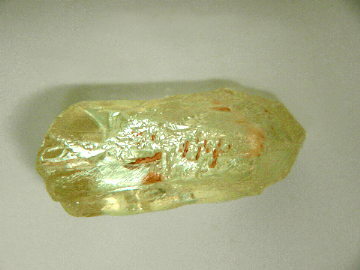 5" long x 1.8" x 1"
This natural kunzite specimen has pale yellowish-green natural color when viewed under daylight as shown at left. This pale green kunzite (spodumene) specimen is semi-transparent with small transparent areas. this genuine kunzite crystal is 2.3" long x 1.5" x 1"
This natural kunzite crystal is unheated and untreated with pale pink natural color. It is semi-transparent to transparent with natural terminations and large gem-grade areas inside! This natural color kunzite crystal is 3.6" long x 1.2" x 0.8"
This natural color kunzite crystal is unheated and untreated. It has beautiful lavender-pink color. See also an opposite side view of this natural kunzite crystal. Yellow Kunzite Dimensions: 4.5" long x 1.9" x 1"
This natural specimen of kunzite weighs 1540 carats. It has pale greenish-yellow natural color when viewed under daylight as shown at left. This pale green kunzite (kunzite is a variety of the mineral spodumene) is semi-transparent with some transparent areas and some fine cabochon gem-grade areas. This natural color kunzite crystal is 2.4" long x 2.2" x 0.6"
This genuine kunzite crystal has light to medium lavendar-pink natural color. It is semi-transparent to transparent. this natural color kunzite crystal is 2.8" long x 1.7" x 0.6"
This genuine kunzite crystal is 2" long x 1.4" x 0.9"
This wonderful kunzite crystal has areas with beautiful light to medium lavender-pink natural color. This natural color kunzite crystal is 4" long x 1.3" x 0.6"
This beautiful kunzite crystal has lavendar-pink natural color. It is semi-transparent to transparent. This genuine kunzite crystal measures 3.9" x 1.7" x 0.7"
This natural kunzite crystal specimen has light lavender-pink natural color (unheated and untreated). It is a transparent kunzite crystal section with some natural terminations. Kunzite Crystal Dimensions: 3.7" long x 1.8" x 1"
This genuine kunzite crystal is 3.7 inches long. It has natural pale pink color. It is semi-transparent with natural terminations. This kunzite crystal is 4.3" long x 1.4" x 1.0"
This genuine kunzite crystal has wonderful lavender-pink natural color. It is mostly transparent with some gem-grade areas! This genuine kunzite specimen is 5.2" long x 0.8" x 1.0"
This genuine kunzite crystal has light lavender-pink natural color, and it measures 5.2 inches long! It is transparent with some gem-grade areas inside. Kunzite Crystal Dimensions: 4.2" long x 2" x 0.5"
This naturally terminated kunzite crystal is semi-transparent with natural light lavender-pink color. The photo at left is back-lit to better show the transparency. This genuine kunzite crystal is 4" long x 1.8" x 1"
This unique kunzite crystal has areas showing both light pink and green natural colors. It is transparent with some gem grade areas inside. Kunzite Crystal Dimensions: 3.8" long x 1.6" x 1"
This genuine kunzite crystal is unheated and untreated with light yellow natural color. It is semi-transparent to transparent with many small gem-grade areas. See also a full-view photo of this natural color yellow kunzite crystal. This kunzite crystal is 3" long x 2.2" x 1"
This unique kunzite crystal is unheated and untreated with strong pink natural color. It is transparent with several small facet grade areas inside. This kunzite crystal is covered with naturally etched surfaces in very good condition! See also another view of this natural kunzite crystal. This natural color kunzite crystal is 5.2" long x 1.6" x 1.2"
This kunzite specimen is a naturally terminated transparent kunzite crystal with greenish yellow natural color. The photo at left shows a close-up of the naturally terminated tip, see also a full view photo of this natural yellow kunzite crystal. Kunzite Crystal Dimensions: 5.1" long x 2.2" x 1.2"
This natural color kunzite crystal has beautiful lavender-pink color. It is semi-transparent to transparent with natural terminations. Natural Blue-Green-Pink Kunzite dimensions: 7.2" x 4" x 2.4"
This rare kunzite crystal weighs 3.54 pounds, and it has very unusual natural blue-green color with some pink areas as well (100% natural colors). This museum quality kunzite crystal has areas with very good transparency, and it stands up naturally in the position shown at left. It is bi-terminated, with all natural terminations. The photo at left was taken under incandescent light. This kunzite crystal is 4.1" long x 1.3" x 0.9"
This naturally terminated kunzite crystal is unheated and untreated. It has pale pink natural color in the upper part of the crystal and pale golden-yellow color at its base! It is transparent throughout its length. 5130 carat Tri-Color Kunzite Crystal Specimen! This kunzite crystal is 6.7" long x 3.1" x 1.8"
This large size kunzite crystal specimen weighs 2.25 pounds! It is a natural color kunzite crystal (kunzite is a variety of the mineral spodumene) with areas showing light pink color, golden-yellow color, and light green color! The photo at left is a back-lit view. See also a front lit view of this spodumene crystal specimen. This specimen is naturally bi-terminated with terminations in good condition. It is semi-transparent to transparent with several gem grade areas inside. There is a 1.5 inch long partially terminated quartz intergrown on the opposite side! See a back lit view of the opposite side of this natural tri-color kunzite crystal. See also another view of this tri-color kunzite specimen. This genuine kunzite crystal is 3.2" long x 0.7" x 0.5"
This 3.2 inch long kunzite crystal is unheated and untreated with pale pink natural color. It is transparent with small gem-grade areas inside. See also another full view of this naturally etched kunzite crystal. This genuine kunzite crystal is 4" long x 1.7" x 0.6"
This 4 inch long kunzite crystal is unheated and untreated with light pink natural color. It is transparent with several small gem-grade areas. See also another full view of this natural kunzite crystal. This genuine kunzite crystal is 5.5" long x 1.6" x 1"
This 5.5 inch long kunzite crystal is unheated and untreated. It is semi-transparent to transparent. The lower 60% of this unusual kunzite crystal has light pink natural color, and the upper 40% is colorless. 6.1 inch Kunzite Crystal Specimen! Kunzite Crystal Dimensions: 6.1" long x 1.6" x 1.3"
This 6.1 inch long crystal of natural kunzite has natural lavender-pink color. It is semi-transparent with natural terminations. See another image of this natural color kunzite crystal. See also another view of this large kunzite crystal. This very blocky, fine quality, facet grade,light tone of yellow green kunzite crystal (also known by some in the trade as hiddenite) weighs 22.9 grams. 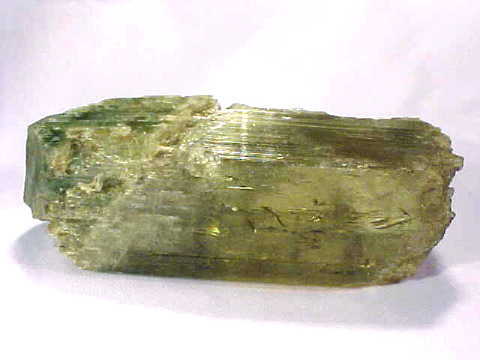 It actually is not green enough to be called hiddenite, and it does not appear to be colored by chromium. It does have a very large area with superb transparency as shown in the photo at left, and could be faceted into a very nice pendant size gem or multiple smaller gems.. This spectacular medium light tone yellow-green spodumene crystal is of natural color, it has not been treated or color enhanced in any way. The color is very very stable and has been fade tested for a long period of time. It is also partialy terminated on one end. See also a edge-view photo. Our Kunzite Lapidary Grade Rough is all 100% Natural Kunzite! Would you like us to inform you when we add more natural color lapidary grade Kunzite on this page? We have a large inventory of natural color kunzite lapidary grade rough in stock at our mineral warehouses, so be sure to let us know if you have any special requests. Please contact our webmaster or our 'site' geologist with any questions or comments.